FILE - This file photo released on Sunday, May 17, 2015, by the Syrian official news agency SANA, shows the general view of the ancient Roman city of Palmyra, northeast of Damascus, Syria. 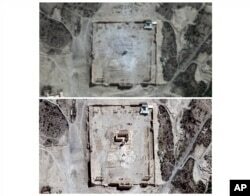 Syria's antiquities chief says Islamic State militants have destroyed three ancient tower tombs in the central city of Palmyra, continuing efforts to demolish a World Heritage Site. Maamoun Abdulkarim said Friday the militants destroyed the three famed tower tombs in recent days including the Tower of Elahbel that dates back to the year 103 AD. He said his information was based in part on satellite images provided by the U.S.-based Boston University. This marks one of a series of deliberate vandalism acts carried out by Islamic State since it captured Palmyra from Syrian government control in May. IS militants had previously destroyed two Roman-era temples in the city, including the Temple of Bel, among other ancient iconic monuments. Earlier this week, the head of the U.N. cultural agency UNESCO called the destruction of Palmyra an "intolerable crime against civilization." The militants claim ancient relics and sites of worship promote idolatry. They also have blown up several ancient treasures in Iraq.